← BEACON Researchers at Work: EDAMAME! This week’s BEACON Researchers at Work blog post is by MSU sophomore Krista Nicholson. Krista was an BEACON Undergraduate Research Apprentice (URA) at MSU Kellogg Biological Station in summer 2015, with mentors Susan Magnoli & Dr. Jen Lau. My partridge peas in the greenhouse stubbornly not blooming. Murphy’s Law states that what can go wrong will, and there may be no better field of science to apply this to than evolutionary ecology. I started my Undergraduate Research Apprenticeship (URA) at Kellogg Biological Station with the illusion that every experiment would work, and that I would always get satisfying results. I didn’t know any better, every lab I’d ever done in school had turned out pretty much exactly like the directions said they would. I soon found out that natural systems don’t like to follow directions. My main task as a URA was to help my mentor Susan Magnoli with her experiments this summer. She studies how genetic diversity may be beneficial in prairie restorations, so we worked in a handful of prairies close to KBS. 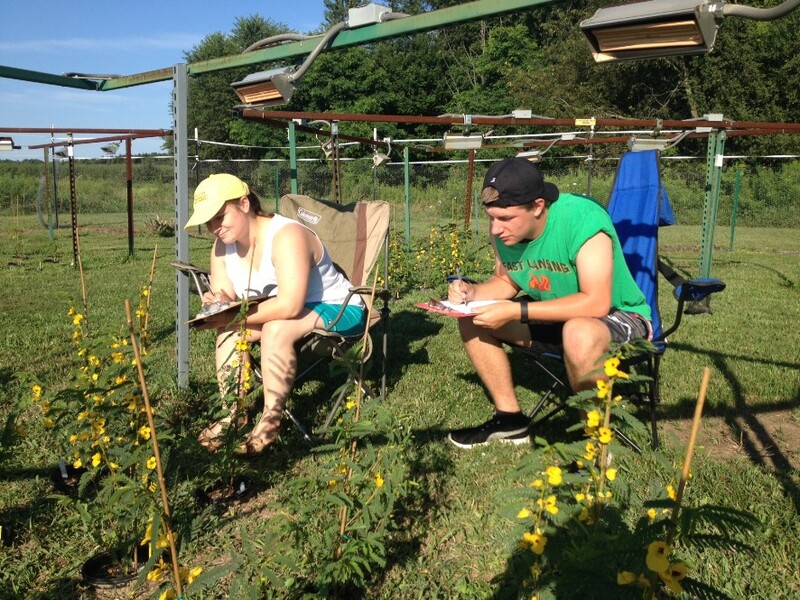 For the first half of the summer we set up plots in two of those prairies, cleared them of debris, planted thousands of partridge pea plants from six source populations, and watered all of them. Then all of our plants were eaten by grasshoppers and voles. Lauren and Aaron, my busy helper bees. After the devastating blow dealt to us by the voles and grasshoppers, all we could really do was use the remaining plants in the greenhouse to set up a few smaller experiments. Susan gave me a number of those plants to use in my own pollinator experiment. 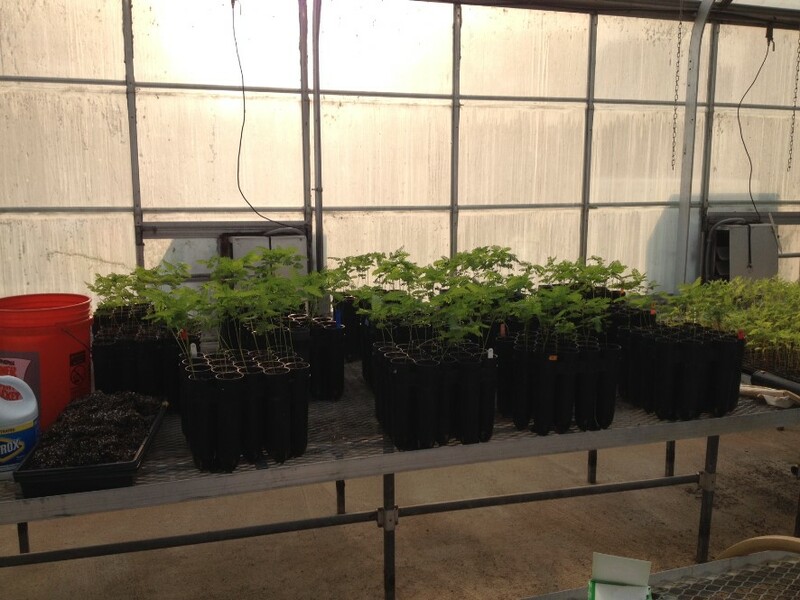 Time passed, my plants got bigger, and soon it was the last few weeks of my internship. Despite getting big and healthy, most of my plants never blossomed. By this point I was losing hope of collecting my own data. There didn’t seem to be any flowering partridge peas that I could use! Mark Hammond, the lab tech for the Lau lab, heard of my plight and came to my rescue. He offered the use of some partridge peas in heating rings at the Long-Term Ecological Research site as long as I helped him collect some data he needed. I was elated, finally a chance for me to do my own science! 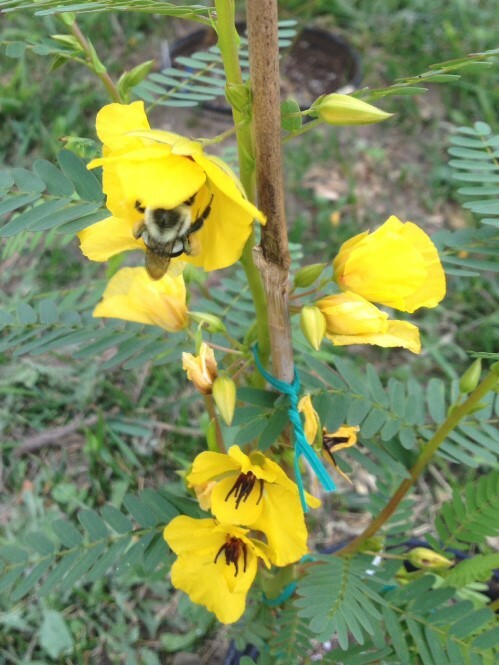 I decided to examine the impact of ants and rhizobia on pollinator visitation in partridge peas grown 3ºC above ambient temperatures. My mentor and I were at the site by 9 am with our comfy lounge chairs and a coffee and set ourselves up to watch the pollinators stream in. Almost none came. A bumblebee pollinating a partridge pea. Again I was nearly ready to give up. I had my plants, they were blooming, but I couldn’t force the pollinators to visit! Then one of the people working in the rings earlier in the morning mentioned to my mentor that he saw pollinators around 8 am, and that if we got there earlier we might see more. Susan and I got up bright and early the next morning, I brought an even bigger cup of coffee, and we set up around 7:30 am. Lo and behold, there were dozens of pollinators! We had difficulty even keeping track of all of them. I was ecstatic, and every day for the next week after we had collected a new set of data I would go back to my room and excitedly input it into excel. Soon the symposium was approaching, and Susan and I (mostly Susan) analyzed the data. A lot of coding in R and some graphs later, I had my results; the manipulated variables had no direct effect on pollinator visitation. The only significance we found was that plants with more flowers attracted more pollinators, and that plants with rhizobia had more flowers. This wasn’t a direct effect, and because of this I was disappointed. How was I supposed to make a poster and present on an experiment without strong results? It was then I realized something. Real research isn’t perfect. I had been told all summer that most experiments fail, but I didn’t realize that applied to me as well. It would have been more surprising if I had found something significant actually! In fact, my observations and results inspired me to come up with a new experiment that I hope to conduct next summer. It finally hit me that if I wanted to do research and be a good scientist I would have to be okay with frequent failure. All most people see is the final product, the glossy paper published in some eminent journal. But real science is about getting your hands (and everything else) dirty, it’s about getting up early, staying out late, failing, redesigning your experiment and failing again, it’s about overcoming obstacles and finding novel solutions, and most of all it is about never giving up. I also realized then that I wouldn’t have it any other way. This entry was posted in BEACON Researchers at Work and tagged BEACON Researchers at Work, Kellogg Biological Station, plant biology, pollination, Research Experiences for Undergraduates. Bookmark the permalink.